FACT CHECK: Photograph Shows President Obama with His Feet on Oval Office Desk? Photograph Shows President Obama with His Feet on Oval Office Desk? A photograph of President Obama with his feet on his Oval Office desk is genuine, but the act it captures is neither "desecration" nor unprecedented. Photograph shows President Obama "desecrating" the Oval Office by unprecedentedly placing his feet on his desk. 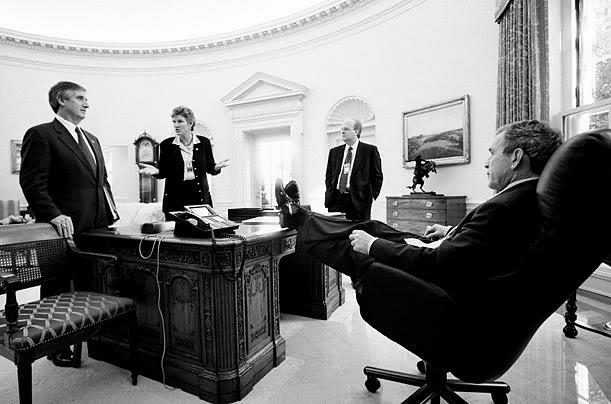 A photograph captures President Barack Obama with his feet on his Oval Office desk. In over half of the cultures of the world, it is recognized not only as disrespectful, but as an extreme insult to show the bottom of your shoes. While this posture is disrespectful in any culture, it is absolutely never done in any executive setting. An executive’s kicking his feet up on a desk or table is an action that can be regarded quite differently in varying contexts: Doing so in the middle of a staff meeting might be regarded as demonstrating rudeness, arrogance, or disrespect; on the other hand, doing so at the end of a long, hard workday while engaging in friendly chit-chat with a few subordinates might be perceived as showing oneself to be a warm, folksy, regular ol’ guy. He thinks of himself as a king — and not as a servant of the people, humbly occupying our White House for his term in office. We should inundate the White House with emails demanding that he stop desecrating his office and keep his feet off of our furniture. This photograph became the subject of renewed interest after President Trump adviser Kellyanne Conway was photographed kneeling with her feet on an Oval Office couch.